Alwington Parish stretches along the North Devon Heritage Coast from Peppercombe, via Babbacombe and Cockington towards Greencliff on the Abbotsham Parish border. Sweeping upwards from Bideford Bay it includes the rural hamlets of Ford, Fairy Cross, Alwington and Woodtown before dropping down to the parish boundary at Yeo Vale. The heart of the Manor of Alwington is, of course, the majestic Portledge House, once the home of the Lord of the Manor and the Pine-Coffin Family. It is hard to believe that such a tiny corner of Devon would have had such an impact on the history of England and its monarchs. Susan Pine-Coffin has written three books related to the history of the Coffin family in the UK. Portledge Manor house was the home of the family for 900 years before the estate was sold into private hands in 1998. In addition the Pine-Coffin family were, for many years, landlords of most of the cottages and land on the eastern side of the village of Bucks Mills, including the lime-kiln "East Kiln". These were sold at Public Auction on 30th June 1982. 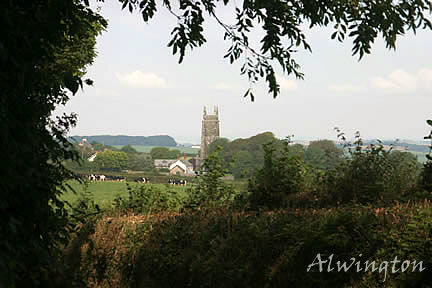 The local Parish church of St. Andrews stands amidst idyllic environs, the Church Yard is an especially tranquil place and overlooks the countryside towards the Yeo Valley. This is also the Pine-Coffin family church and as such there are artefacts, murals and monuments to be found within the Church and in the Church Yard. The "School Room", the little building nearby used to be the Church School and was built in 1836, it closed in 1956 when the school was merged with St. Helen's at Abbotsham. Traditionally, as with all rural villages there is an annual Village Fete and Christmas Fair and a number of other fund raising events throughout the year in aid of the church, chapel or school. The Village Hall at Fairy Cross was built in 1933 and has been used for all manner of activities including dances, concerts, coffee mornings, bingo, skittles, bonfires, barbecues and is also now used by the community for special celebrations and weddings. Other buildings of note are the Methodist Chapel which celebrated its centenary in 1997 and the old Alms Houses at Ford. Fairy Cross also has two unique structures which stand proud on each side of the A39 Atlantic Highway. These are by far the most elegant Bush Shelters in the South West and were hand built by local craftsmen. The history, life and times of "Alwingtonians" is wonderfully illustrated in the book "Alwington a Millennium Experience" which was published in 2000 with contributions from the whole community. There is no pub, post office or shop now but there is a pub and post office stores at Abbotsham just down the road. Bideford Town is just five miles away. All the hamlets within Alwington parish are within easy reach of the coastal villages of Bucks Mills, Clovelly and Hartland where you can explore or enjoy walks along the South West Coast Path. Families with children can enjoy a fun day out at the Big Sheep at Abbotsham where there are a host of fun-based activities both indoor and outdoor. Beyond Abbotsham is the Blue Flag beach at Westward Ho! Pefect for water sports enthusiasts, safe bathing for children and two miles of golden sand. D. Hubbard-Fielder, The Story of Bucks Mills & Bucks Cross, available from Bideford Library & information supplied by the Braund Society. The Coffin Letters - Letters to and from members of the Coffin Family in England between 1600's and 2002. The Coffin Diary - Diary of John Edward Coffin from his days in South Africa with the Mounted Infantry in the Boer War 1900. A Tale of Two Bridges - Based on the Diaries kept by Colonel R.G.Pine-Coffin DSO MC which he kept throughout the 1939-45 War in Europe.